17" x 8" x 50mm Wheel, 5x150 mm Lug Pattern (PCD), Forged Aluminum Construction, TRD Forged Wheels have a higher strength to weight ratio versus cast wheels and maintain OE ride and handling. Distinctive off-road styling with polished simulated bead lock ring. 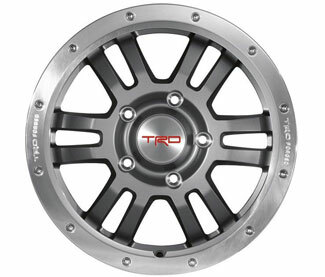 Gunmetal Gray spokes with machined and formed TRD logo center cap.. This product requires: PTR27-60080, PTR45-34120.